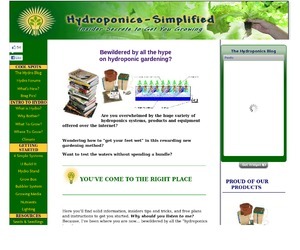 Tomatoes are the prime choice for outdoor hydroponics. They recapture the flavour long gone from supermarket produce, and the theoretical maximum yield is very high, twenty pounds per vine. In your first season, though, you're doing fine if you get about half that much. A fast growing, medium-sized staking variety produces more and better quality fruit than the larger hybrids. Tomatoes are grown quite close together in hydroponics, four to six inches. A good arrangement in a sixteen by twenty-four inch unit would be to set a row of five plants along the rear edge and fan them out against a wall on strings or trellises. Figure 22. 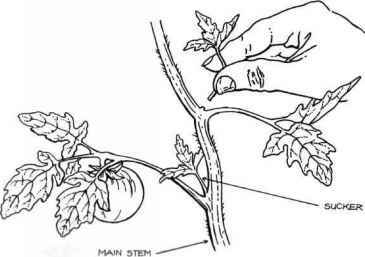 Prune tomatoes by pinching off the suckers that appear in the crooks between branches and the main stem of the plant. shock. After the first fruit-set, remove the lower branches one or two at a time. After the next fruit-set, remove the branches between the first and second fruit-set the same way. Use pruning scissors if possible. It is also a good idea to do this indoors with your bush tomatoes. It keeps the energy going to the fruit rather than to the lower leaves, which by this time serve no useful function. 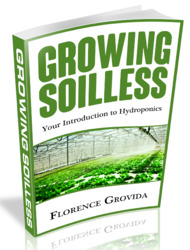 Intercropping and outcropping were described in Chapter 7, and the outdoor season is the time to take full advantage of your hydroponic growing area. In the planter where you have placed your five tomato vines, don't forget to plant pole beans in a corner. They will frame your garden with cheerful foliage while taking up little room in your planter. The remainder of the space is still available for a wide range of herbs and flowers. Be sure to pay attention to the rules for Companion Planting given in Chapter 7. In colder, more northern regions, try to get a good head start on the painfully short growing season. Another good arrangement in your outdoor unit is about nine tomato vines around the perimeter of a 16" X 24" tank. Between each tomato seed, place a cucumber seed. You can now have the tomatoes growing up and the cucumbers growing over the side. Once you have obtained the first tomato fruit set you can start removing the lower stems and as soon as there is sufficient light penetration to the growing surface, you can also intercrop with leaf lettuce. Quite a crop for two and one-half square feet! Make sure you keep your hydroponic system on a table or stand when growing outdoors. If you don't, all kinds of creepy crawlies will invade your plants. Towards the end of autumn, it's time to move your garden back indoors. Because every latitude and location is different, find out from the local Agricultural Department when the first frost is expected. You will still have an extra month for growing at the end of the season over your dirt gardening friends, because of the protection and heat loss from your building and because your planters do not sit in or on the ground. Before you move your garden indoors (and whenever you harvest a complete plant) remove the root stock from the growing medium. Also, check your plants and planters carefully to make sure that any insect infestations aren't taken indoors. Otherwise, there are no special instructions for taking your garden back inside. The plants you wish to keep will survive quite well, and there is little danger of temperature or light shock. If you do find that insects are present, however, you must either terminate your plants, clean out your system and sterilize the growing medium, or spend a couple of weeks making sure you have eliminated all infestation, broken the egg hatching cycle and destroyed any eggs lying dormant in your gravel. Only after this is done is it safe to bring your units indoors. To sterilize the growing medium, place it into a foil roasting pan. Bury a potato in the centre of each pan. Set the pans in the oven at 450°F (232°C), and when the potato is done, your growing medium will be sterilized. The same should be done with the drainage medium, if you are using one , or you may wish to replace it completely. This would be a good time to add dolmitic lime (see Chapter 4), ifyou have found it necessary in the past. How To Pruning Tomatoes Plants? How to prune tomato plants? How to Prune Tomato Suckers? How to hand prune tomatoes?